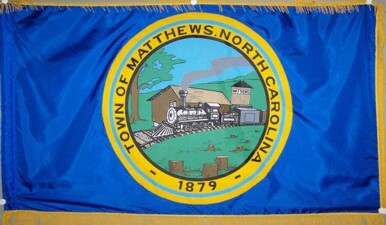 The flag of the Town of Matthews, North Carolina, has a town seal on a blue background. The seal shows a train in a station and local rural scene, encircled by the inscription "TOWN OF MATTHEWS, NORTH CAROLINA / 1879". Photo of the flag thanks to Wayne Cogdell, IT Manager, Town of Matthews. "Matthews is a town located in Mecklenburg County, North Carolina. The population was 26,901 according to the 2006-2008 American Community Survey." - from Wikipedia: en.wikipedia.org/wiki/Matthews,_North_Carolina.